"It’s a short film but the more you look the more you see. The notion of women being the property of men makes you think of The Handmaid’s Tale. A scene where a group of tinwives is ominously taken to a grey vault (to be reprogrammed? Melted down) has shades of the holocaust in it. And the idea that the robots might be more human than humans, as propagated by the rebellious evaluation centre inmate Juliet, is worth pondering." Saskatoon StarPhoenix - Read it Here. 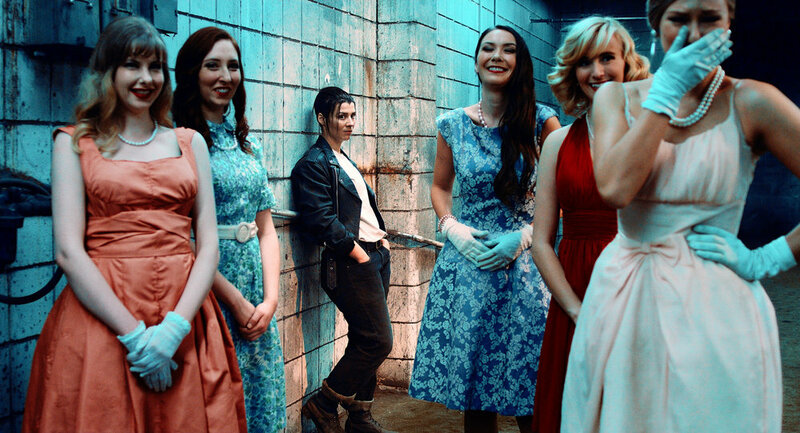 "The authentic 1950’s feel, right down to the fashions and music is highlighted by the incredible score of composer Zak Millman and his group of musicians. You have to hear it to believe it. All in all The Tinwife is a visual and auditory feast that will have you thinking about it for sometime afterwards." 5D Blog - Read it Here. The Tinwife / Screencraft Short Film Spotlight. Read it here. Director Travis Neufeld talks to WE ARE MOVING STORIES. Read it here.